The Bremenn Clinical company places its focus firmly on providing clinical-strength skin care solutions that target specific skin-related issues. 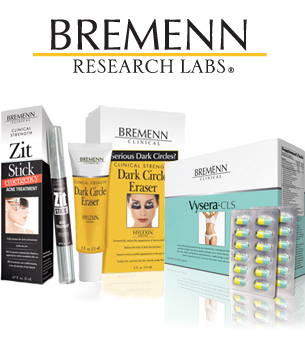 Rather than creating a ubiquitous wrinkle cream, the Bremenn Clinical scientists developed products for areas of the body that are of particular concern, such as facial dark spots, forehead wrinkles, or facial spider veins, to name just a few. DrSkinSpa.com is an Authorized Retailer of Bremenn Clinical. All Products are Guaranteed Authentic & Fresh. The company followed up with even more specifically targeted solutions such as products for hyperpigmentation on the hands or the face, sagging upper eyelids and more. Bremenn Clinical Upper Eyelid Lifter is a clinical-strength formula that supporter the eyelid’s integrity. Solely the drooping, sagging appearance of aging eyelids are targeted with this product; the company focuses on this one problem that often occurs with age, rather than coupling the cream with other ingredients that also attack puffiness. As a result, the Bremenn Clinical Upper Eyelid Lifter is able to make eyes look fresher and more alive.